Have you seen this sweet pup? Van Cleef & Arpels is looking for him! When I saw on Instagram that Van Cleef & Arpels was showing a vintage dog clip from their 1954 “La Boutique” line under the tag #MissingPreciousPuppy, I thought it was just a way to celebrate their vintage animal brooches, but it turns out they are actually looking for this pooch! Apparently the Heritage Director of Van Cleef & Arpels (what a job, I am so jealous), Catherine Cariou, would like to locate this puppy, as well as the parrot in the center, seen below, in order to recreate the advertisement, from 1966. 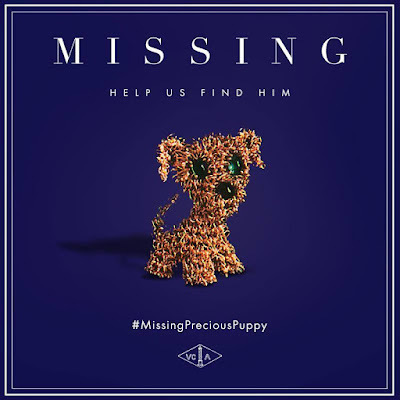 The ad VCA would like to recreate once they find the puppy and the parrot. I have not come across either of these brooches in my fairly new jewelry travels, but I will certainly keep a lookout now! 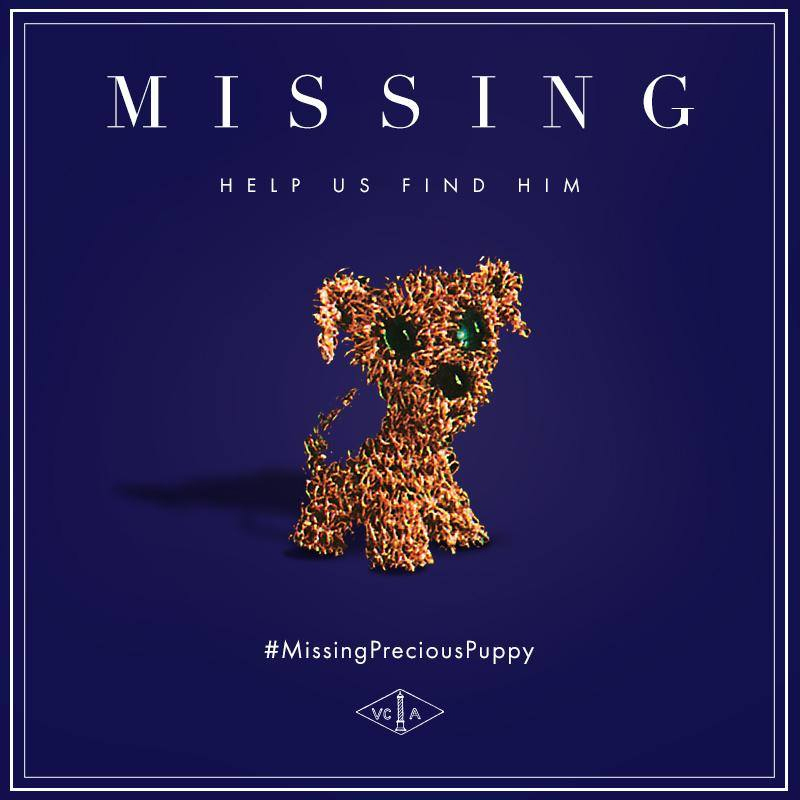 If you have seen the puppy or the parrot click here, Van Cleef & Arpels wants to hear from you! I have seen some of the others from the line and thought it would be a fun post to include them. 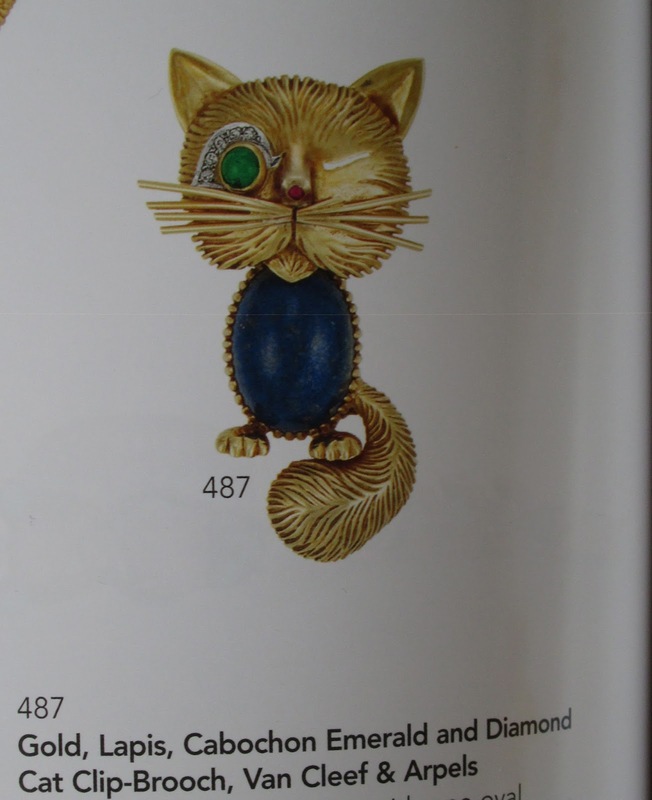 Some I’ve glimpsed in person at jewelry shows, the others in auction catalogs. They have a whole gallery of them over at Yatzer, which is helping in the hunt, so swing by and prepare to be charmed! 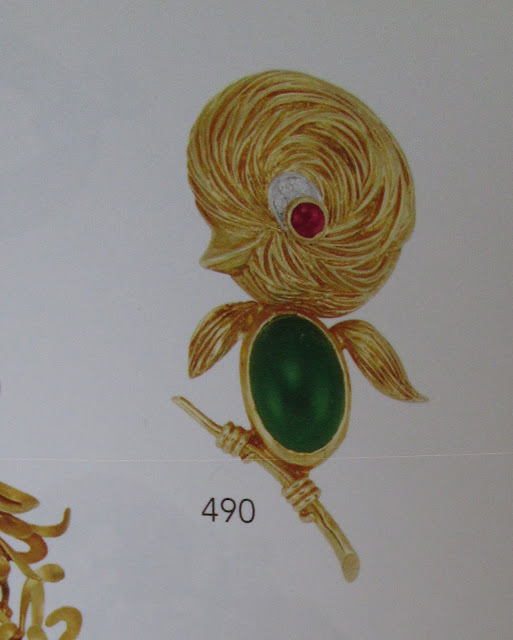 An adorable bird with a green onyx belly from a Doyle New York catalog from 2010. 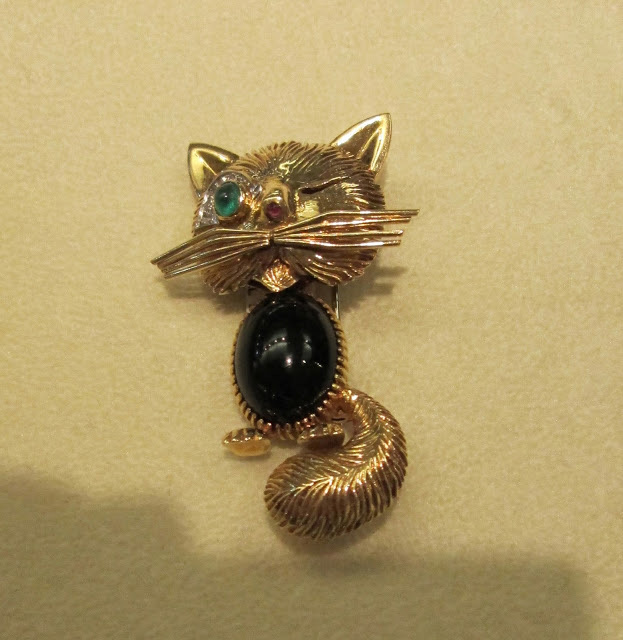 Spied this cranky cat last July at The New York Antique Jewelry & Watch Show. I am especially enamored of “Le Chat Malicieux,” created in 1954, and it’s nice to see VCA made it with different bellies. I saw it in person with onyx but a Doyle New York auction catalog from 2010 featured it with lapis lazuli, which I actually like better! I read at Yatzer that Aristotle Onassis purchased one of these and Sophia Loren bought four of them. Love it! I would love to own one someday. This version features a lapis lazuli body. 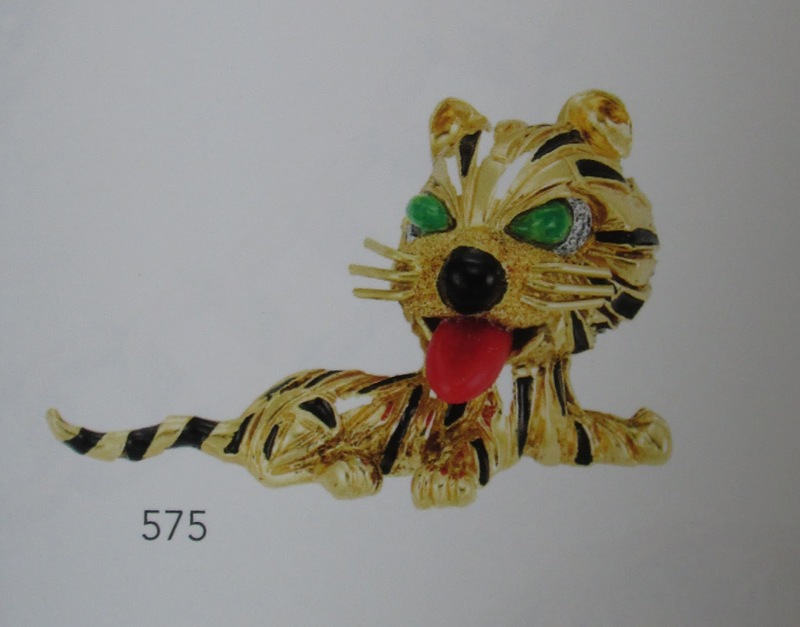 I have no idea if the tiger below, also from the same Doyle New York catalog, is part of the “La Boutique” line, but he seems like he would be. I love him! He would be so perfect to wear to a party (or anywhere, really). I am so crazy for this tiger! 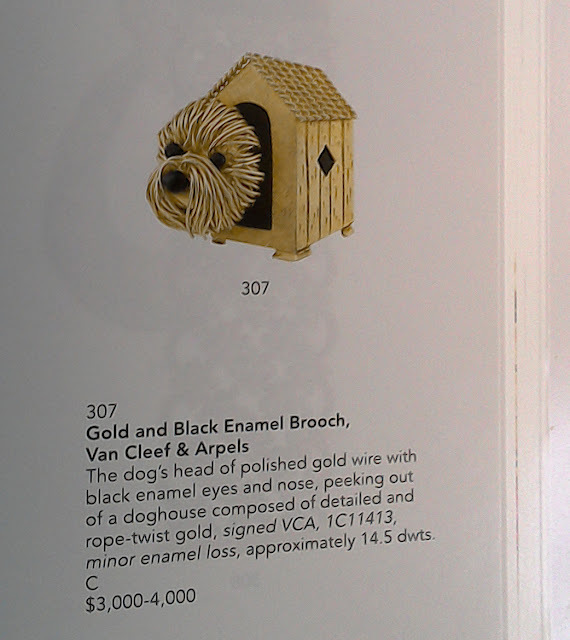 A Doyle New York catalog from the “Important Jewelry”auction they held in December of 2015 featured this oh-so-cute dog-in-the-doghouse, which also seems like it would be part of the “La Boutique” line-up. I have a cat, but I love dogs too, so the VCA dog clips always bring a smile to my face. 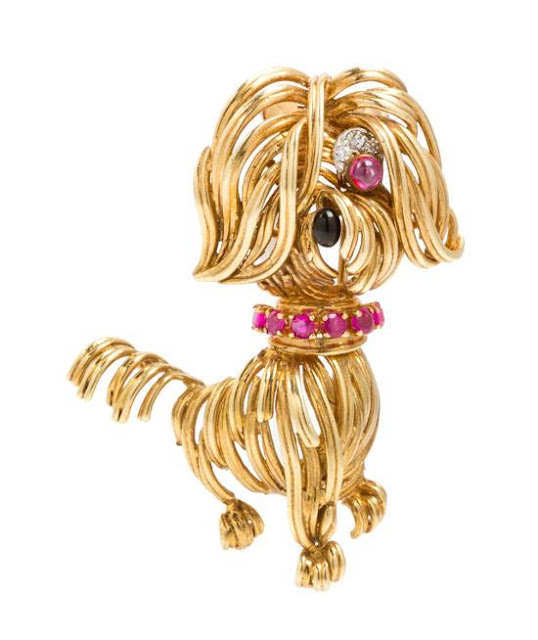 This jaunty pooch with the tousled hair and ruby eye and collar was one I saw featured last year in an auction at Leslie Hindman Auctioneers. I have seen a few of this particular clip shown in auction catalogs. One of my favorites ever. I adore this jaunty pooch! 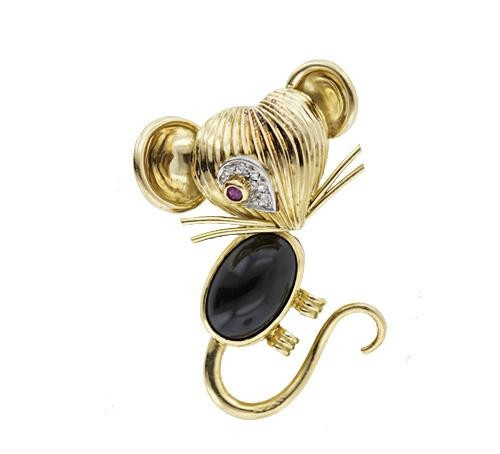 I haven’t seen the mouse clip in person yet but I include it for my friend GSL, formerly of The Lion’s Den and lately MIA, who once asked me, perhaps with a bit of sarcasm, if Van Cleef & Arpels made a church mouse. It took me about fifteen seconds with Google to learn that yes, indeed they do, or they did. Isn’t it so sweet? I would not say no to adding this to my jewelry collection! This photo is courtesy of Lang Antiques, who offered it for sale. I do believe this is the “Curious Mouse” clip that Yatzer says was one of the 13 clips Aristotle Onassis purchased. The man had good taste in jewels! Best mouse ever. GSL, this one’s for you wherever you are! Photo by Lang Antiques. 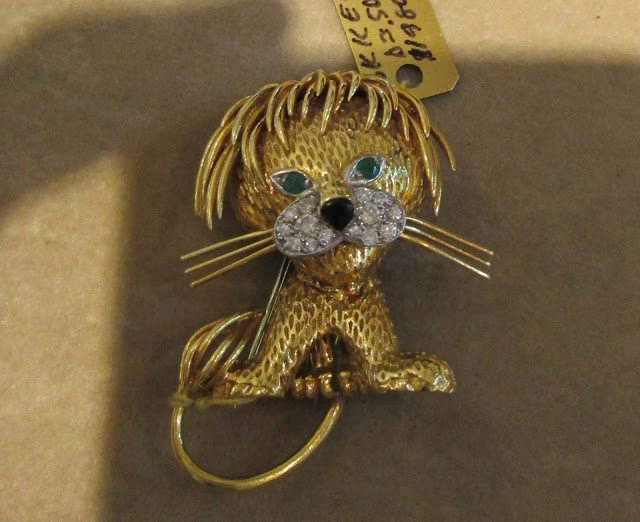 This “Lion Ebouriffé” is a clip that was owned by Princess Grace of Monaco. Aristotle Onassis bought this design, as did Prince Aga Khan. There is one for sale over at Beladora if you are interested! The design was originally released in 1962. Let me know which is your favorite from this unusual menagerie and let Van Cleef & Arpels know if you find their puppy! I'm back after a brief interval ducking hackers. I do love Precious Pup and Church Mouse! 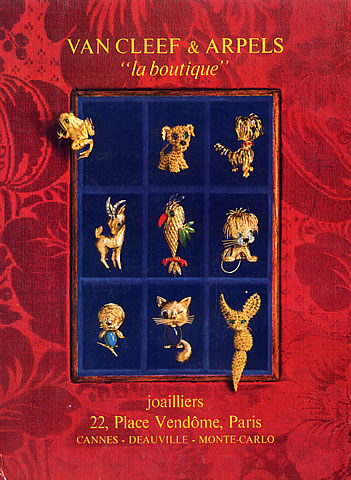 I adore those wee animal brooches...I would happily have anyone of them. Hope that the missing puppy is found. Hope they find it. Those brooches are adorable. Hi Jenna, I hope they find it too. I am going to be on the lookout until they do!